These easy Baked Chicken Taquitos are stuffed with chicken and cheese and make a great appetizer or meal. These homemade taquitos are a family favorite! Plus, learn how to make taquitos you can freeze for later! Taquitos are basically rolled up tacos, stuffed with your choice of meat and cheese, and then fried crisp. To keep these taquitos on the healthier side, we bake them in the oven. Don’t worry, you won’t miss the frying, they still get nice and crispy in the oven. Taquitos are usually made with corn tortillas and flautas are usually made with flour tortillas. 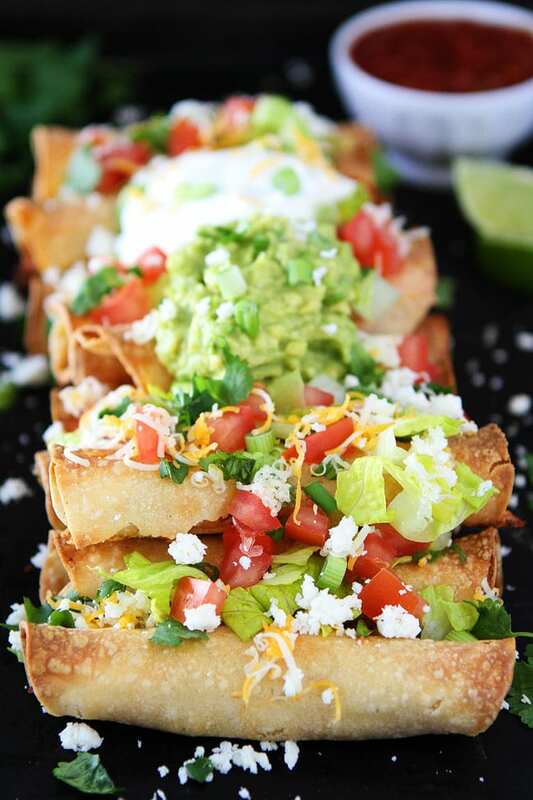 We love using corn tortillas for these taquitos. They are gluten-free and so delicious! We start with corn tortillas, add shredded chicken and cheese, and roll them up. When the taquitos are done baking, we top them with all the toppings…shredded cheese, lettuce, diced tomatoes, sour cream, guacamole, cilantro, pico de gallo, and queso fresco. We also serve them with salsa for dipping. The boys love dipping their taquitos, it is all part of the fun! 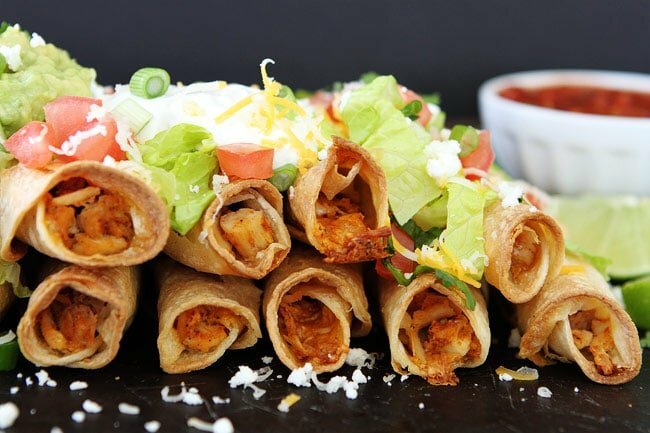 These chicken taquitos can be served as an appetizer or as a meal, it just depends on how many you eat. :) They are perfect for parties because you can make them in advance and put out all of the toppings for your guest to enjoy. We are going to make them for Cinco de Mayo, which is right around the corner. I can’t wait! We like to use rotisserie chicken for this recipe to keep it easy peasy. This is also a great recipe for using up leftover chicken. Just shred it and you will be ready to go! Before you roll up the taquitos, place the corn tortillas in between damp paper towels and heat them up in the microwave for 20-30 seconds. This will make them easier to roll and keep them from tearing. The taquitos can be made in advance. You can reheat them in the microwave or the whole pan in the oven after they have been baked. You can even freeze the taquitos before you bake them. Place the taquitos on a baking sheet and freeze. When frozen, place taquitos in a freezer bag and freeze for up to one month. When ready to bake, preheat the oven to 425 degrees F and place frozen taquitos on a large baking sheet. Spray with nonstick cooking spray. Bake for 15-20 minutes. Are you guys ready to make some TAQUITOS? Come on, yell it with us! It’s TAQUITOS time:) Enjoy! These easy oven baked taquitos make a great appetizer or meal! We like to serve them with sour cream, guacamole, salsa, pico de gallo, lettuce, tomatoes, and cheese! In a medium bowl, combine the shredded chicken with the cumin, chili powder, salt, garlic powder, paprika, and fresh lime juice. Stir until chicken is well coated with the seasonings. Stir in the shredded cheese. Get two paper towels damp and place two tortillas at a time in between the paper towels. Place in the microwave for 20-30 seconds. Remove from the microwave and roll up the taquitos. 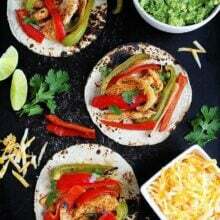 Place a heaping tablespoon of the chicken and cheese mixture in the center of the tortilla and roll it up tightly. Place the tacquito, seam side down on the prepared baking sheet. Continue rolling taquitos until the tortillas and filling are gone. You should have about 20 taquitos. Spray the taquitos generously with nonstick cooking spray. Bake for 15-20 minutes or until taquitos are golden brown and crispy. Remove from the oven and serve warm with desired toppings. So bright and vibrant! I love the look of these and the idea of sharing. The only thing is, I’m not very good at sharing my food, haha. 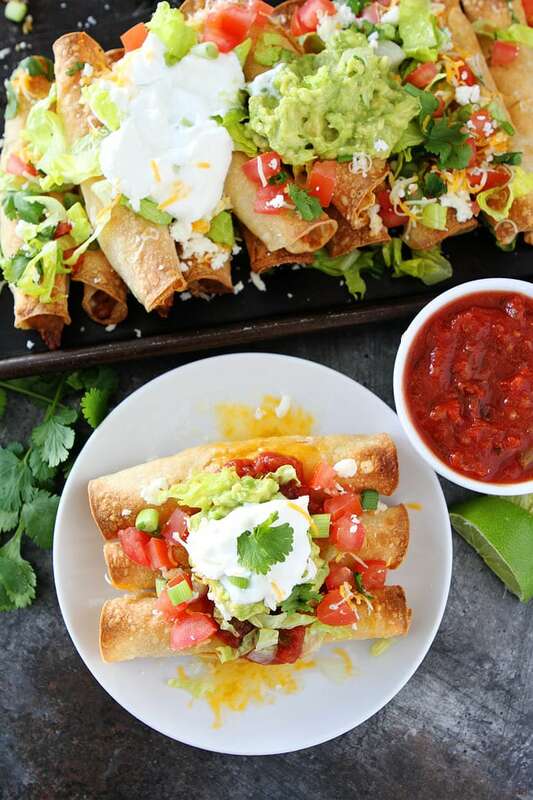 Those baked taquitos look amazing!! WOW. OMG- my stomach is growling. My kids would just flip for a batch of these! Mexican food! I have really been wanting some guacamole lately… Also, your food photography skills are making me jealous. hey girl- I would soooo love these right now!! It’s lunch time! yummy! Totally want these for lunch today! They look so good, I’m going to have to try them. OMG These look like a total crowd pleaser! Those look so nice and crispy and good! These we delicious! I used flour tortillas because my family prefers them to corn tortillas. They got so nice and crispy in the oven. The recipe is very fast once the chicken is ready. My family agreed that these were so much better than the ones you can buy in the freezer section of the grocery store. Yay! I am so happy your family enjoyed the taquitos. Can you tell me what size flour tortilla’s you used? These taquitos look amazing! I’ve got pin these for our next party! I’m halfway through my second pregnancy and the whole time all I have been wanting to eat is taquitos!! I made these tonight and they were a huge hit!! My hubby and I loved them and so did my two year old! Thank you for another awesome recipe! Glad the taquitos were a hit! Thanks for letting us know. Best wishes with your pregnancy! These look so amazing!! Gotta make them for my boys, mmm!! My family loves Mexican flavors but I’ve never made taquitos. I think they’ll love this! We can use all that things but not for flautas or tacos. Thanks for love Mexican food. I hope you eat a real Mexican food. Just made this and we liked it a lot. Next time I will add some jalapeño’s and onion before baking. Amazing! A big hit with my whole family, this will definitely be a go to recipe! A friend on Facebook posted this recipe and I had to try it. So tonight for dinner I made them, and OMG they are so good. I ate 5 of them. I love taquitos but they are so unhealthy because of them being fried but these are perfect for those, like me who are trying to eat healthy but still love Mexican. Will keep this recipe in the dinner line up forever. Glad you liked the taquitos! Thanks for letting us know! My daughters eat vegetarian. Can you make these with black beans instead? We have had veggie tacos before w/ diced sweet potatoes, corn and black beans. Add all the spice her recipe calls for. It is delicious. We made these tonight for Cinco de Mayo! They are SO easy and delicious! We did have some trouble with the corn tortillas staying rolled up. I would like to try these with flour tortillas. Any suggestions for using chicken that hasn’t been cooked yet in this recipe? An easy thing to do is put chicken breasts in the slow cooker and shred them. These were delicious and filling! My daughter has celiac and I look for gluten free healthy recipes. She’s never had a taquito before because most processed ones are with flour. I never thought of making them. These were easy and so good! Thank you! Made these for dinner tonight. Delicious! And so easy. Thanks for this wonderful recipe. we love tacquitos, but I do not like frying foods if I can help it. these were so easy to make and so tasty. it was hard to believe they were so crunchy without being fried! thanks again for a great family dinner recipe. So glad you liked the taquitos! Going to try these soon. Queso Fresco sounds like it’s much the same as kefir. I make kefir, and mine is usually like a fresh cheese. Think I could substitute kefir for Queso Fresco? Queso fresco is more like feta cheese, it has that texture/consistency. Just made these for my family. They were a huge hit! My picky child loved them! Thanks for the recipe! I used 1 pound ground chicken for this recipe… very good! I made these recently for my 2 year old and he loved them! And so did my husband and I 🙂 Can’t wait to make them again!! Can you tell me what size tortilla’s you used? I use taco size corn tortillas. What brand of corn tortillas did you use? Did you get them damp enough? Met with rave reviews from my family! Did I miss the smart points? I don’t know the smart points. Made this and we loved it! Great alternative to frying. I will definitely make again! I made these vegetarian. Yum! One batch with cumin and garlic spiced refried beans, chedder and onion…one batch with cumin black beans, rice, tomatoes, peppers, onions and garlic. Both great! I am going to make a batch. They sound delicious. I’ll let u know how everybody loves them. These were so good and super easy to make. My family of six ate these without complaining. (Which isn’t normal…lol) Thanks! Easy to make and very tastey. Left overs ?? Just reheat in microwave or if you like eaten cold. “Spray the taquitos with cooking spray”? No way. That’s criminal. The recipe isn’t bad, though it doesn’t really suit my taste (needs more spice). Good baseline though. Um, have you actually sprayed food with cooking spray and cooked it? Because I do it ALL THE TIME and it works out extremely well. When you’re seeking a healthier alternative to frying, spraying with vegetable oil cooking spray and popping it in the oven is the way to go. Don’t knock it until you try it! The very reason I sought out a recipe like this is I automatically figured if I sprayed the tortillas with cooking spray and baked them at a high enough temperature I could get them crispy to get a similar taste to fried taquitos. And yes, it looks like it can be done so I’ll definitely be trying this tonight! Thanks so much for the recipe! Can you freeze these without toppings? Yes, they are freezer friendly! Is it better to freeze these before or after baking? This is a great weeknight recipe! Quick and easy, and Yummy! The only alteration I made to the recipe, was to use canned turkey instead of the rotisserie stuff. I always have canned turkey in the house. I never follow a recipe the way it’s written, so for me to stick to the original this closely means it’s a dang good recipe. I will be making this again! ANY IDEA of the calorie /fat count of these? 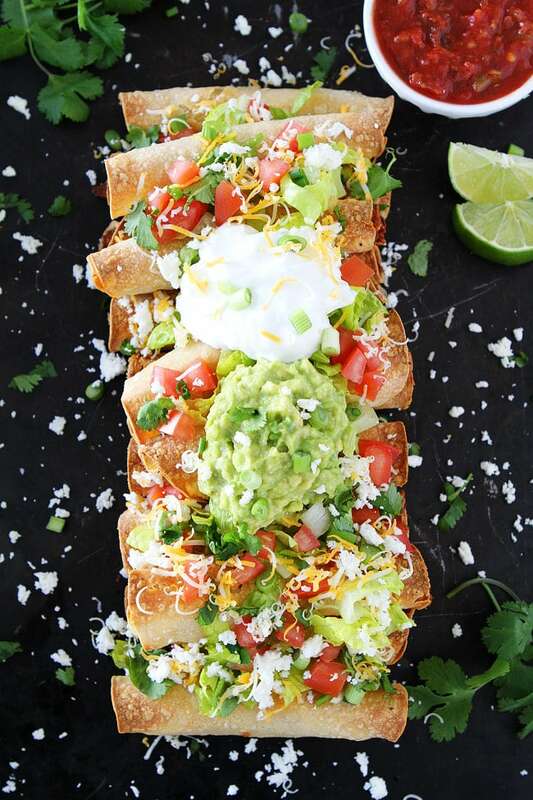 I think I might be seeing these taquitos in my dream tonight…. Delicious ! 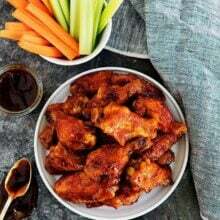 am also reads your posts but this is one of my favorite recipe, and i can’t wait get cook this dish. 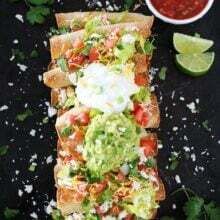 well your baked chicken taquitos looks many colorful & yummy with attractive. Thanks for sharing ….! Thank you so much for sharing your recipe! I watched a friend make homemade taquitos and she made it look so easy (she used rotisserie chicken as well) but I wanted more of a kick when it came to the filling and came across this recipe while searching how to season chicken for taquitos. Anyway, I really loved the flavors you put together. I ended up frying them instead of baking though, and I was wondering if you have any tips on preventing the corn tortillas from falling apart? I heated them in-between moist paper towels as I found the tip online, but they still fell apart. What am I doing wrong? Any advice? Thank you. Absolute new favorite in our house! These were easy to make but I thought they were quite bland and I even upped the spices. Also pretty dry. These look perfect for my family! I can’t wait to try this one. Oh wow, I could eat this whole dish! So easy and looks delicious! Yum this look so good. I’m going to have to try them! I would like to make these tonight but if there are leftovers, would they freeze well for the microwave another day? I wonder if I could add cream cheese to this. The mixture seemed pretty dry. 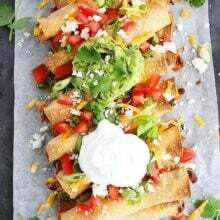 OMG This recipe is wonderful Baked Chicken Taquitos is a favorite in our house and I need new ways to cook it. I love how easy this sounds and this looks like something my family will love! Those look so perfect! Thanks for the recipe! I made these tonight along with refried beans and Mexican rice. I used the rostairre chicken as well. They were so simple to make. They got two thumbs up from my roommate and his friend. I’ll definitely be making these again! These are wonderful! I made these a couple of weeks ago and am making them again tonight! Growing up, taquitos were one of my favorite foods. Now, all grown up, they’re still one of my favs. These turned out crunchy, delicious and with less guilt. I used Trader Joe’s Just Chicken ( all breast meat and roasted) instead of a rotisserie chicken. Less work and less waste. Thanks for a great recipe! This time I made it with the corn tortillas. Last time we made it with flour tortillas because that’s my preference. However I think I’m going to convert to corn for this recipe. I did get 22 out of it. We love love love this recipe! This is my second time making these. Who knew they’d be this easy to put together? I’ll never buy frozen again. My roommate and his girlfriend absolutely loved loved loved them. The first time around we did flour tortillas this time I used corn. I’ll definitely be making these again! Thanks for the great recipe! I halved the recipe as there are only two of us and it was very tasty. Thank you so much for a healthier taquito recipe! 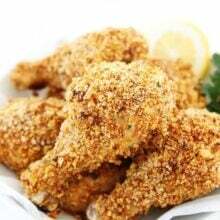 These are super easy, fast, tasty and not greasy because they are baked.You easily adjust the seasoning to your style. Love the process in the mico-wave to soften the tortillas. As anyone who has tried in the past to roll these up out of the frig, you end up with broken, messy tortilla pieces everywhere. Hope to try them with left over steak or pork. Thanks, they were grand! This is become a favorite easy recipe, I make it probably once or twice a month! Being Mexican and loving our traditional food but without all the oil. Loved this way to cook them. The corn tortillas brake after I rolled them up. Any ideas as of why? I warmed them up before rolling them. My taquitos were really dry, so we loaded them up with all the trimmings–which made them messy to eat. Solved the problem by making them into enchiladas (pouring enchilada sauce over them in a casserole dish.) Don’t think I’ll make them again. BUT I learned about Queso Fresco from this recipe. Good stuff! These look like something my family will love. Can I roll them and put them on the baking tray and store for a few hours in the frig before baking? I make a lot of things from your website but I don’t usually come back to comment (the enchilada bakes are my favorite) but this time I really wanted to thank you. I have always wanted to make taquitos but never knew how to get the corn tortillas to roll up. While I altered the recipe to make black bean and cheese since my husband and I are vegetarians, the basic process was the same and WOW they were amazing and so easy. I used canned black beans, 2 heaping tablespoons of fresh salsa, mexican blend cheese and adobo spice, salt and pepper. Thank you Maria, I am going to make these as soon as I buy the ingredients, ha! I had no idea you could bake these. They look delicious! They look very delicious, I have to try it !!! We were very impressed! I cooked using the convection setting on my oven and rolled them once to make sure all sides were crisp. We tried these tonight and the 6 of us finished them off. Everyone loved them! Thanks for the recipe. These are GREAT! New family favorite. Thanks for sharing. Yummy, yummy!!! Made them last night and they were a hit!!! Easy and the whole family loved this version of chicken leftovers. Not bad. The chicken filling turned out very dry. Flavor was just okay. I used my air fryer and sprayed the Taquitos with some olive oil, air fried them for about 6-7 minutes at 380 degrees then turned them and sprayed them with some olive oil and baked them another 5 minutes. A quick meal for the two of us. I used the large tortilla shells and cute them in halve and filled each with the chicken mixture. This made it easier to fit into my air fryer. I made these last night for dinner . They were fast and easy . Very delicious. Since we were eating them as our meal I used medium tortillas and filled them fuller, so I only got 8. I will definitely make these again. Kind of sad that my corn tortillas kept falling apart. This was so easy and delicious! Definitely will make this again! Quite delicious! Excellent flavor and texture on a Friday night after teaching all week! A light meal yet filling with the addition of Mexican rice I will add twice as much cheese next time. We tried both the corn and flour tortillas, both were delicious. Could you do a vegetarian version? So Delicious .i really like this and all of ingredients are perfect for made this recipe.This is so sweet experience. If you like this type of recipe you can visit Friends of Pho restaurant. Looks so tempting. Will surely try this recipe. Thanks. These look amazing and they don’t look difficult to make. I’m putting this one on the “To Cook” list! We always add a can of green chiles, some diced onion, and diced garlic to the meat. My kids just love this dish! My son actually complained because I said I was going to make it all week and flakes out. So I had to make them for breakfast – I know! – and be ate 3 of them! They were flour tortilla, so they were pretty big, and he’s a very small 10 year old! Lol! I made some with whole wheat tortillas and those actually came out more crispy. Yum! We don’t usually have nonstick spray so we just brush ours with a little olive oil. They don’t last long in the frig! Thanks for sharing! These were delicious. I made homemade Pico and quacamole. Low calorie. Definitely a do-over. Love this easy recipe! Comes out a little different each time I make it. Always good. These were so easy to make and a total delicious hit in my house tonight for dinner!